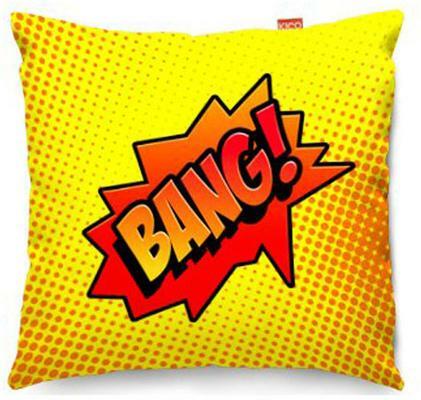 Inspired by either Andy Warhol or DC/Marvel Comics, this cheerful Comic Bang Yellow Sofa Cushion is a real charmer! Equipped with a classic look, this piece is an instant winner when it comes to whimsical design. The bright yellow colour is a real eye catcher while the bold words stating 'bang!' right in the middle is true beauty as well. Prop this up on your living room space or maybe use it inside your child's bedroom; it'll instantly win some praises thanks to its unusual and beautiful look. You'll also adore the fun it brings to any space! This comes in two sizes so you can pick the perfect size that you need. Whatever you need it for and wherever you might place it, rest assured it'll gather the attention it deserves.